Audi will enter the world’s largest auto segment in the world, the class of compact sport sedans with the all-new 2014 A3 and S3 sedans. The new sedan will be a sporty and hot compact sedan and will launch later this summer in Europe. Audi is upping the ante and bringing the new sport sedan to compete with the new 2014 Mercedes-Benz A-Class that launched earlier this year and the highly successful BMW 3 Series. Will Audi be able to compete with the two sport sedans? Audi has brought everything they can and developed a sport sedan that looks like it will compete well with Mercedes and BMW. Audi has positioned themselves well and the new A3 arrives at a perfect time when buyers are looking for smaller performance oriented offerings that are also fuel-efficient. Both Mercedes and BMW have shown that buyers are flocking to this segment and Audi is looking to take advantage of current market conditions with the A3 and S3 sport sedan. It starts underneath with the new A3 getting new lightweight chassis that is made of high-end hot formed steel. The new A3 will weight just 2,755 lbs. (1,250 kg) and will feature an aluminum hood. Audi will offer all-LED headlights and optional light-emitting diodes on the taillights that will set the sporty sedan apart. The new compact sedan combines “classic notchback styling with the dynamics of a convertible.” And as we see with all Audi vehicles, the single-frame radiator grille is the primary design element up front. 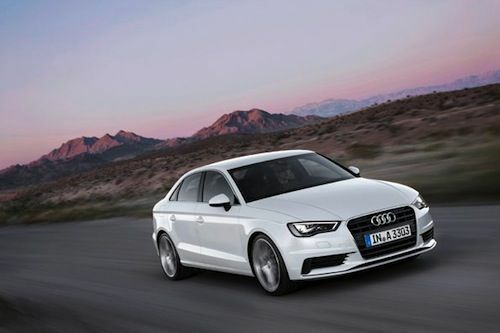 In Europe, the new A3 will come with three engine choices, one diesel variant and two gasoline TFSI units. They will come respectively with 1.4, 1.8 and 2.0-liter engine displacement. A new feature for Audi on the 1.4 TFSI is the cylinder on demand (COD) system. At low loads, it temporarily shuts off two cylinders. Audi says additional engines will be unveiled down the road, including a 2.0 TDI which will comply with the emission limits of the EU’s Euro 6 standard, and a 1.6 TDI. Engines can be coupled to either a manual transmission or an available S tronic automatic. Two sport suspensions will be available with 16 wheels and 19-inch wheels with Audi magnetic ride. The new Audi A3 will feature a comprehensive range of infotainment systems for buyers to stay connected. They include a Bang & Olufsen sound system and MMI navigation plus. For the first time, Audi connect will soon grant one-of-a-kind Internet access to A3 customers. Audi says that starting in November 2013, the fourth-generation (“4G”) mobile communications standard known as LTE (Long Term Evolution) will be available in the A3 Sedan. A new generation of buyers will be drawn to the new high-tech features. The new innovation allows passengers to use their mobile devices to connect to WLAN hotspots to access services like navigation via Google Earth images and Google Street View through Audi online traffic information, Facebook and Twitter. The system will include a new Audi connect service parking-space locator. This feature provides information on parking spaces, multi-level parking facilities and underground garages. Audi didn’t forget about performance enthusiasts. Shortly after the new A3 arrives, Audi will launch the hot S3 Sedan with a 2.0 TFSI powerplant that will produce 221 kW (300 hp) and 380 Nm (280.27 lb-ft) of torque. The S3 will be fast and will have a 0-100 km/h (62.14 mph) sprint time of just 4.9 seconds with the six-speed S tronic (5.3 seconds with the manual transmission). It will have an electronically limited top speed of 250 km/h (155.34 mph). It will feature a special electronically controlled, hydraulic multi-plate clutch and the sport suspension lowers the body by 25 millimeters (0.98 in). It will also get larger brakes for extra stopping power and 19-inch wheels are available in conjunction with Audi magnetic ride. The S3 will also be fuel-efficient and its four-cylinder turbocharged engine averages just 6.9 liters of fuel per 100 km with the S tronic (34.09 mpg US). Audi should compete well in the compact sports sedan segment with Mercedes and BMW. Audi has designed the new 2014 A3 and S3 Sedan with plenty of high-tech, sporty and hot options for buyers to get excited about. The new model will be available in German showrooms late this summer. The base A3 Sedan 1.4 TFSI price will start at 24,300 euros. Watch 2014 Audi A3/S3 Sedan Sneak Preview video.